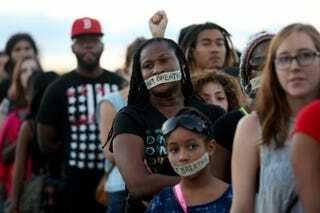 Demonstrators stand with tape reading, “I Can’t Breathe” as they march along Interstate 195 to protest police abuse on Dec. 7, 2014, in Miami. One Illinois woman is hoping to get the trademark to the dying words of New York City’s Eric Garner to use them for commercial purposes in one incredibly classy move, the Smoking Gun reports. Catherine Crump of Waukegan, Ill., wants to use “I can’t breathe,” the now-popular rallying cry against police brutality, for use on hoodies and T-shirts for people of all genders and ages. She issued an application for the trademark on Dec. 13. Since a New York City grand jury failed to indict Pantaleo in Garner’s death, protesters have taken the phrase to the streets, staging die-ins and chanting Garner’s last words over and over again. Influencers in the community, mostly athletes such as LeBron James and Kobe Bryant, have also donned shirts declaring “I can’t breathe” during game warm-ups. Crump told the Smoking Gun that her application has “nothing to do with the Garner family,” and that she has not spoken to them about her intent to go after the trademark. She told TSG that her intention in marketing the clothing was not about making money, but she did not express exactly why she chose to go after the trademark. The Smoking Gun notes that Crump isn’t the only person to try to trademark popular protest phrases. At least three other opportunists have filed to trademark “Hands up, don’t shoot!” which is a statement protesters have been making in solidarity with unarmed Ferguson, Mo., teen Michael Brown, who was shot to death by now-former Officer Darren Wilson.